Avid readers will remember I have two favourite inverters. There’s my sentimental favourite, the Trannergy (aka Shanghai Grrl) and the Enphase. Well, yesterday we replaced a 6 year old grrl that was playing during a lightning storm (this did not end well) with an Enphase IQ7+ system. The grrl lost one of her MPPTs and her logging. The ET 200W panels had copped a million volts and instantly got coffee stains on the cells. We replaced the ETs with REC 320NPeaks. Anthony is on the 44c tariff so we had to keep the inverter and array size less than the original, but it’s only 100W less. Anthony’s grrl has been chatting to pvoutput.org incessantly for the last 6 years. So what we have now is the ability to compare an identical string and micro system on the same roof. Guess what? The Enphase is running at 18 – 20% better than the old grrl. 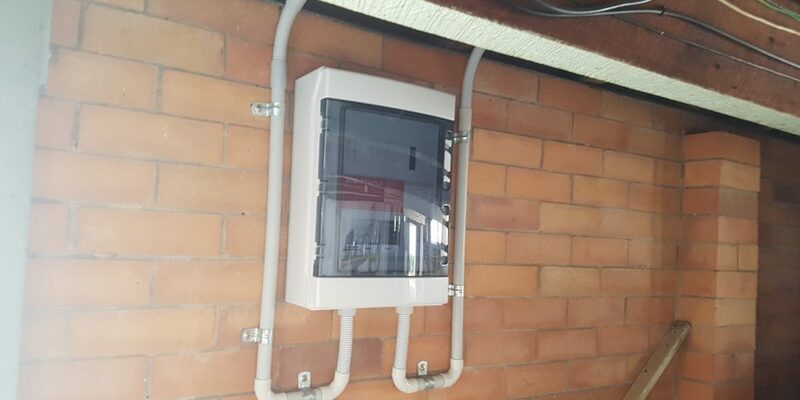 Yes, Enphase is more expensive than a Trannergy ( or any string inverter) but if you want to maximise the yield from your roof and you want a safe solar system without DC isolators please get in touch. Of course, if Enphase is out of your budget, you really can’t beat a grrl. Particularly when she’s all dressed up with a Solar Analytic and a Catch Green. 100% Solar and Battery installation inspections are a must! More and more articles are appearing on TV and in newspapers about shoddy solar systems. Although I’m disappointed, I’m not surprised. Too many people buy on price, unsurprisingly they get exactly what they pay for. Last week I held training seminars in Brisbane, Tweed, Sydney, Melbourne and Perth attended by a number of solar installers. After the completion of training we discussed issues confronting our industry in 2019. None of us are happy with the standard of installations. We don’t believe we need more regulation and guidelines, only that the existing regulations are enforced. In most States, there is no or very little inspection of electrical work. Around 1% of solar installations are inspected by the Clean Energy Regulator. These inspections have revealed a high level of non-compliance with regulations and guidelines. The consensus of the training groups was that 100% inspection of all solar and battery installations should be mandatory. Feedback from Tasmania is that their model has been successful in raising the standard of installations and ‘cleaning out the shonks’. The Tasmanian model has Techsafe subcontracting to the Department of Justice to carry out 100% inspections. We would prefer inspections to be carried out by inspectors directly employed by the Electrical Safety Office in each state. We recognise that this could be a costly exercise and agree that a $250 fee per inspection is reasonable. There are no barriers to entry in this industry. Anyone can set up a Facebook page or a webpage, advertise and sell solar systems. Most of these sales companies have no license to trade as an electrical contractor. Most of them do not display their license on advertising because they don’t have one. Typically these sales companies sell cheap, shoddy systems with a high failure rate. When the warranty pressure becomes overwhelming they disappear or phoenix to continue under a new name. We ask that the regulations around unlicensed electrical contracting be strictly enforced. We agree with the need for an industry code of conduct. However the consensus view is that a voluntary code of conduct will only be observed by reputable installers who are probably already observing at least the spirit of the proposed codes. The proposed COAG Behind The Meter code is voluntary. There is no obligation for a sales company or installer to sign up. Observing the BTM code will add operating costs giving the less reputable companies not observing the code a price advantage. Most reputable installers are members of either NECA, MEA or the Smart Energy Council and have therefore signed up to their codes of conduct. The Clean Energy Council’s Approved Retailer Scheme is seen as a money grab. Accredited designers and installers already agree to a CEC code of conduct, which is unenforced. We’re sceptical that the CEC has the ability to improve retailer behaviour considering their failure to maintain the installation quality standards of the industry over the past ten or more years. The inclusion of sales companies with history of substandard work and poor ethics calls the integrity of the ARS into question. Subsidised battery installations are already being subcontracted to questionable companies. CEC’s successful lobbying of state governments to restrict access to tenders and subsidy schemes to ARS’ is seen as anticompetitive, particularly as NECA, MEA and SEC have similar codes of conduct. We ask that you revisit the decision to restrict access to government tenders and subsidy schemes to CEC Approved Retailers. From our perspective it appears that the state regulators assumed the CEC had control of the industry and derogated responsibility to the CEC. The oversight of the industry by the Clean Energy Council has allowed a plethora of unlicensed sales companies to install poor quality, dangerous solar systems. These sales companies use poorly trained, underpaid subcontractors who, in turn use utterly unqualified staff to carry out electrical work. The CEC has allowed both the solar and battery accreditation courses to be reduced to three day tick and flick, everyone wins a prize events. Installation of solar panels usually includes running up to 1000 volts DC circuits, capable of creating unquenchable arcs. Batteries store large amounts of energy in chemical form which can be rapidly released (ie explode) in fault conditions. Unlicensed sales companies sell these systems and poorly trained, skilled and paid workers install them. Very few of these systems are inspected. We already see large numbers of fires caused by poorly installed and designed solar systems. There is no reason to think battery failures will be any less prevalent. Unfortunately battery failures will involve explosions and toxic chemical fires. Responsibility for electrical safety enforcement is held by state governments. Subsidies for battery systems expose state governments to reputational damage if and when problems start. In the interests of consumer safety and the reputation of the renewable industry, we request as a matter of urgency that enforcement of existing electrical rules and regulations by state inspectors be applied. I have also started a petition on Change.org. If you agree that electrical safety should be enforced, please sign the petition. 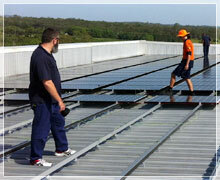 Visit All categorizedLeave a Comment on 100% Solar and Battery installation inspections are a must! This article shows the importance of state regulators and the need for inspections of electrical work. It shows that solar and battery installations (at least) need to have 100% inspections. 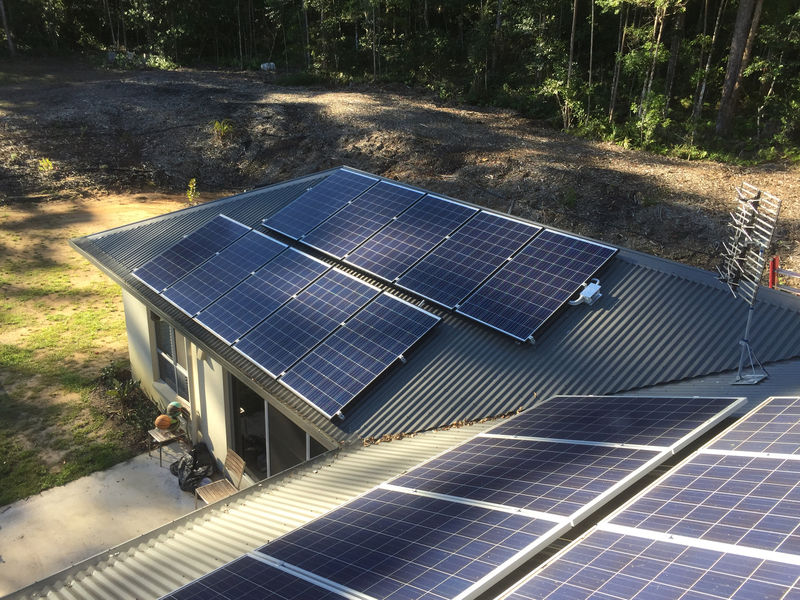 This has worked well in Tassie, has cleaned out the ‘3 x 5kW in a day roof monkeys’ and levelled the playing field so that reputable installers can charge a sustainable price for a proper job. Unfortunately the state regulators were under the impression that the CEC/CER regime had the solar industry sorted. They clearly haven’t. Removal of STCs (or at least a move to metered STCs) will encourage proper design. Mandatory inspections will ensure proper installation. John Howard set up the Business Council for Sustainable Energy which morphed into the Clean Energy Council. Voting rights are set up so that 20 corporate sponsors, including Adani and other foreign owned fossil fuel companies, can outvote all the other members. 5000 solar installers have no vote at all. The CEC set themselves up as industry regulators, writing ‘installation guidelines’, accrediting installers and removing accreditation when guidelines are breached. When they’re held to account for the plethora of cheap , broken landfill solar systems they claim they’re not regulators at all and it’s all someone else’s fault, namely the state inspection bodies. The state inspection bodies were also victims of neoliberalism, for example Joh sacked all electrical inspectors in 1989. Other states followed. State regulators thought the CEC were looking after solar standards, but in fact they were not – they just made noises as if they were. Solar installers have been trying to get the CEC or state regulators to do something about poor quality, dangerous systems for years. State regulators refer us to the CEC and the CEC refuse to listen to our complaints because ‘they’re likely to be motivated by competitor rivalry’. Left with nothing else solar installers started a FB page ‘Crap Solar,’ which has over 5000 members. A page called ‘CEC Installers working together’ was started so we could talk about our concerns. It was quickly changed to ‘Solarcutters working together’ because nobody wanted the CEC in the name. It has nearly 2000 members, which illustrates the contempt the CEC is held in. The discovery by Angus Taylor this week that a large proportion of solar installations are dangerous came as no surprise to us in the industry. None of this would have happened if the state regulators were allowed to regulate and enforce the rules. Responsible industry members have been calling for 100% inspection of all solar and battery installations by state inspectors for some years now.. The CEC has gone into denial. The CEC response is to ramp up their ‘Approved Retailer Scheme’ which, apart from requiring an annual payment of up to $6000 pa to the CEC for a shiny badge does very little in terms of quality assurance. The state of the industry makes you wonder whether the CEC are truly incompetent or whether they’re doing exactly what they’re paid to do by their fossil fuelled owners. If you’re looking for a new, safe solar system contact Positronic Solar – we’ve been doing solar and batteries for 30 years. If you have concerns about your existing system, contact us for an inspection and clean – it’s about $300 for a 5kW system, plus any repairs or replacements that are needed. Most importantly, ensure that any installation or maintenance of your solar system is done by a reputable company using gear backed by solid manufacturers with real warranties. This photo illustrates a couple of reasons why you should contact Positronic Solar for solar panel servicing. 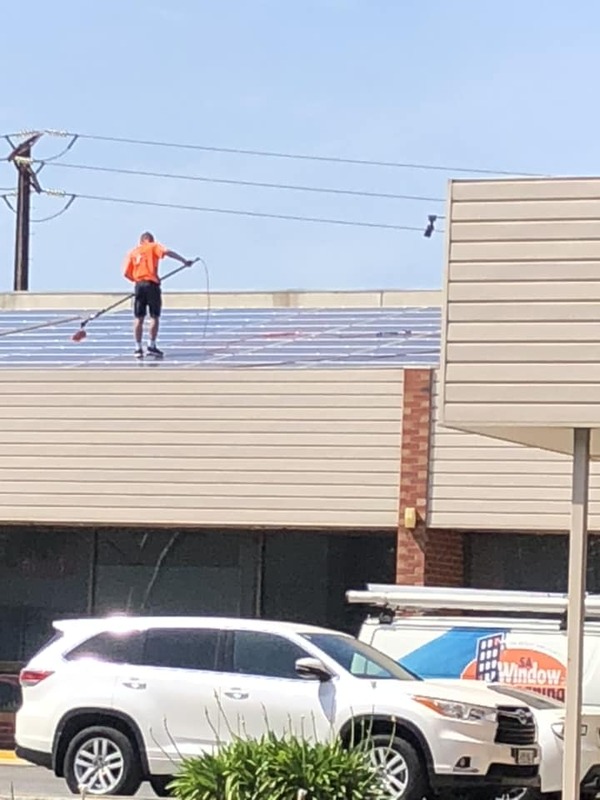 The most obvious fail here is getting panels cleaned by a panel cleaning company. They’re almost invariably clueless about the damage done by walking on panels. They have no expertise in solar at all therefore they’re not going to pick up any problems that your system might have. This 100kW array is now officially stuffed. It will develop cracks in the wafers reducing its output and eventually causing a fire. The array design doesn’t help either because no provision has been made for maintenance or making it idiot proof. If you look at our photos of Estilo on Kittyhawk you’ll see a decent gap between rows and the panels are on a tilt, meaning you’d really have to try hard to walk on them. If your system needs a clean, call Positronic on 3103 6018. We’ll not only clean them, we’ll go over all the connections, switches etc and advise on any repair work that may be required. We won’t stand on your panels. Last week the Clean Energy Council held their annual All Energy conference. More importantly, Solarcutters held their first gathering. 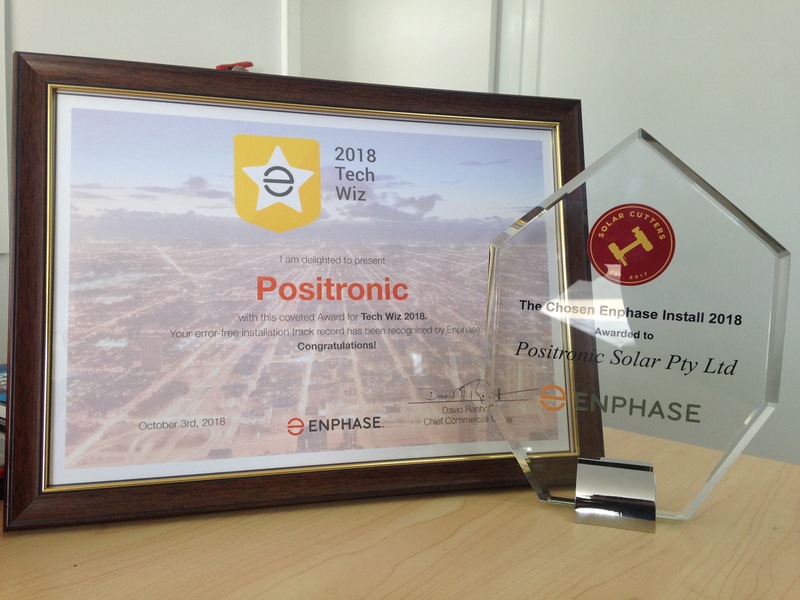 Positronic picked up a couple of awards for our work with Enphase. We received the Solarcutter’s Chosen Enphase Award for our Estilo 90kW installation. This award is particularly treasured as it is chosen by our fellow installers around the country. Thank you to our colleagues. We also received the Tech Wiz award from Enphase for our error free installation record in the past 12 months. How Much Solar Power Do I Need To Run My Home? 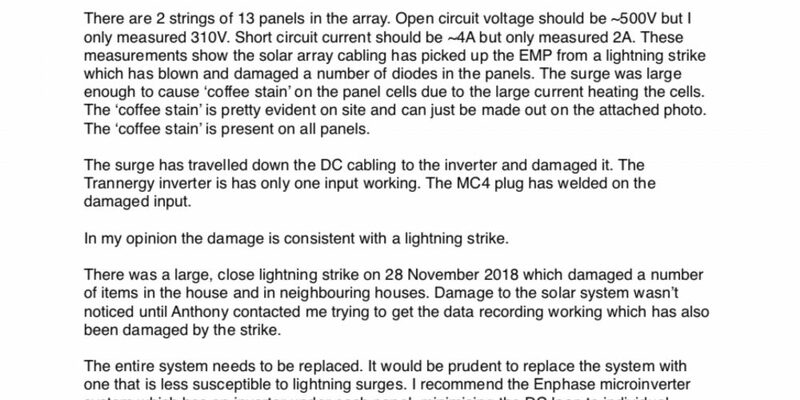 Let’s face it, Australia’s electrical power woes are well documented. In fact, with household utilities increasing by 20% on average in 2017 alone, I challenge you to tell me a person who hasn’t complained about the sky-high cost of their utility bills. 168% higher than the US. It’s little wonder then that more and more Australian homeowners are considering turning to solar energy. With this in mind, one of the most frequent questions we get asked is “How much solar power do I really need for my home?” Let’s dive in and take a look closer look. Typically, the relevant size of a solar power system is known by its Peak Volume (PV) amount. This is the amount of electricity your system is likely to produce on a gloriously sunny day. So, a 5kw system, for example, will produce roughly 5000w at peak sunshine. 1kw equals 1000 watts – Got it? Great! So, if your system was made up of 250w panels you would need 20 x 250w panels in order to collectively generate 5000 watts or 5kw. So, what can you expect to run with 1kw (1000 watts) of power? While that seems pretty good, there’s a catch – I know, there always is! A 1kw solar system will only give you 1000 watts of power for a few hours a day – Remember peak volume? So your 60 low energy bulbs, for example, will only be working for a short period of time. So how do you overcome these peaks and troughs? The answer…by connecting to the electricity grid. Okay, so it may seem counterintuitive to connect to the very thing you’re trying to escape from, but while the grid absorbs any excess energy you don’t use in your home (e.g, when the sun is strong and you aren’t running the A/C) it also works in reverse and can be used to top up your electrical needs when you’re using more power than your solar panels can output. The question now is…how many solar panels do you need in order to offset your electricity usage? Step 1 – Look at your most recent utility bill and note the amount of KWH’s you’ve used in the previous four quarters. This gives you a better overall representation taking into account the seasons. Let’s imagine you use the national average of 5840 kwh’s per year. 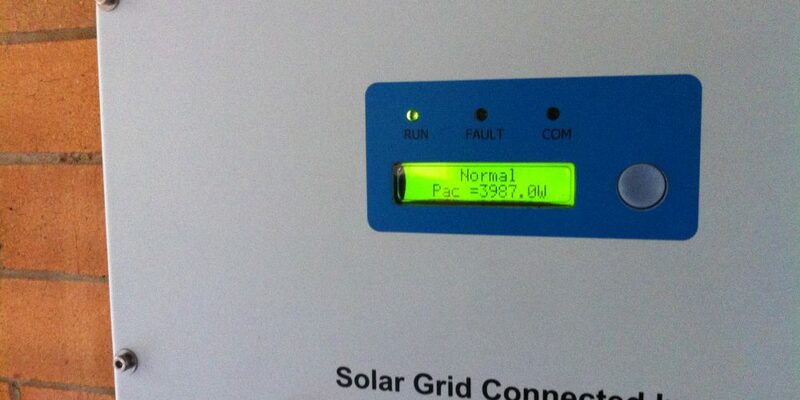 Step 2 – Now divide your annual KWH output by 365 – This gives you a daily figure – For this example that’s 16kwh’s per day! 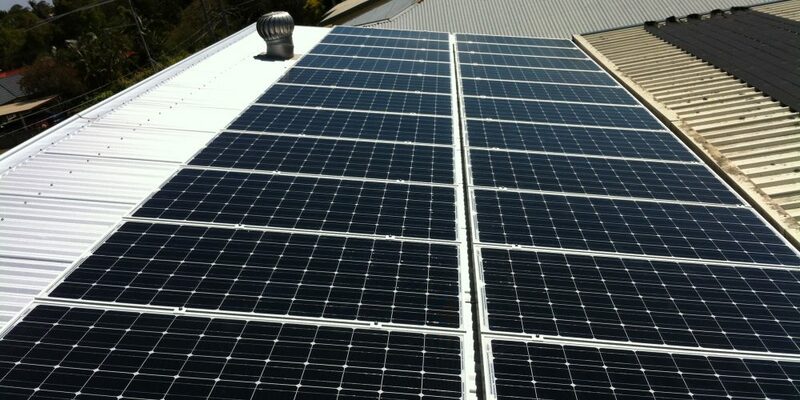 Therefore you would need a 3.8kw solar energy system to generate the same amount of electricity that you currently use. So there you have it…That’s how you can quickly work out how much solar power you need to run your home. Talk to an experienced company who can design a system to suit your exacting needs. This way, not only will you get good advice, but also you’ll get all your questions answered, leaving you with the ability to make a better-informed decision. Visit All BlogLeave a Comment on How Much Solar Power Do I Need To Run My Home? As a business owner, installing a solar energy system might seem like a risky move. Okay, so you’ve probably heard about large corporations turning to solar power, and maybe it’s something you’re considering in the distant future when your company has grown sufficiently enough to afford the major investment needed to be environmentally ‘good’. But for now, it isn’t a strategic financial decision you really need to think about. Or, so you thought! Instead, it may be time to join the throng of savvy small business owners that have discovered the real benefits of solar energy for their businesses. Smaller businesses are also capitalising on the financial savings that an ‘all singing all dancing‘ solar energy system provides. With this in mind, let’s crunch some numbers…This is a financial decision after all, right? According to Energy Consumer Australia’s preliminary ‘Small to Medium Sized Enterprise (SME) Report’, the average annual electricity bill paid in 2017 by Queensland businesses was approximately $12,000. That’s $1000 per month. In addition, Finder.com, Australia’s largest online comparison site, suggests that even installing a 5kw solar energy system generating between 18 and 25Kw of power will cut your energy bill by around 21% per year. That’s an average saving of $2520 per year or $210 per month. The good news for you is that the cost of buying solar panels has dropped considerably here in Australia and with electricity prices continuing to fluctuate unpredictably, it makes the financials of going solar even more attractive. Let’s face it, we live in a world where global issues are important. A world where buzzwords like ‘sustainability’ are being rolled out with extraordinary frequency. So, who’s not going to love a company that proves their commitment to sustainability. Buyers love products and businesses that care about their environment– enough said! Following on from above, 21st-century employees love working for ethically responsible companies. And, it doesn’t come much more responsible than harnessing power from nature. Employees of sustainable companies tend to be happier, more productive, and ‘on-side‘ with the company mission. When a business contracts their solar energy installation to a local company, invariably, workers in the local market carry out the installation. As they get to know you and your company, they’ll develop trust and at some time in the future when they’re in the market for your (insert product or service here) you’ll be the first name on their list. As you can see, the numbers certainly do stack up. 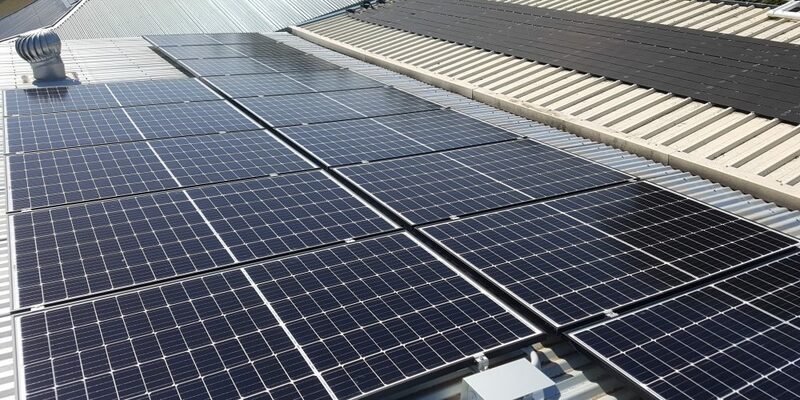 Solar panel systems really are the smart investment for businesses! If you’d like to find out more about how we can help your business, contact Positronic Solar today on 07 3103 6018 and talk to our friendly team of experts.